Carmans almond hazelnut vanilla bars are a lovely snack option for work or home.They are very filling and they taste great.A very good brand to buy. I always stock up when I see Carman’s Almond, Hazelnut Vanilla Nut Bars on Special. They are so moreish. A great Low GI snack that keeps me going until lunchtime or a snack in the afternoon to overcome 3.30itis. It keeps me from reaching from sugary alternatives. I just wish they were cheaper to purchase. I make my own museli bars these days. All organic, paleo & gluten and fructose free. But, these are my top pick if I need a store bought option. About 1.5 tsp sugar per bar and full of nuts and seeds, it’s a great alternative. Nice flavour too. I really liked this flavour, the only thing that would make it better, would be some chocolate, other wise very nice. 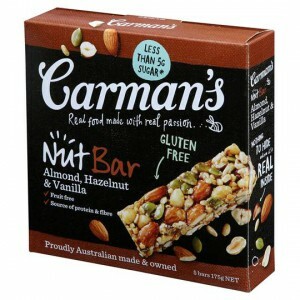 How would you rate Carman’s Almond, Hazelnut Vanilla Nut Bars?